This is a super high performance antenna for use with any Dragon Link receiver. And SMA mount Male connector with 3 CM of Semi Rigid Coax to proetect the receiver and it SMA connector in case of a crash, and is ideal for use in Copters and Small planes. Plastic tubes are included to keep the wire elements straight, but are flexible and designed to bend in case of a bad landing or crash. For maximum performance and long range of 10 KM or more, both antenna wire elements should be stright and vertical, and mounted away from Video Transmitters, Cameras, and other noise prodcing devices. For COPTERS and small FPV planes. The top element should be straight, while the bottom element can hang free, or be routed flat along the copter body. This will still give you really good performance, and still give you a much longer range any copter is capable of flying. This antenna should NEVER be used in a V configuration. 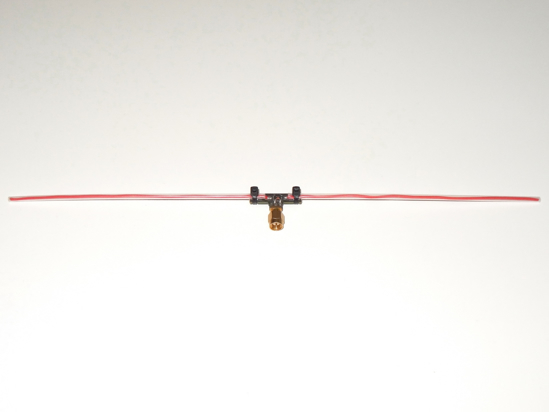 This antenna is designed to be durable, but for planes that take a lot of abuse, and tend to flip on landing, you may coat the little transfomer in the middle with expoy glue if you like to prevent this part from being damaged.